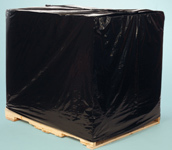 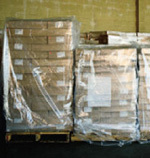 Plastic pallet covers and Bulk Box and Bin Liners are available in over 100 sizes in 1.5 mil to 4 mil poly. 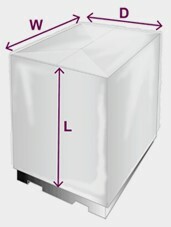 Get the size you need, below is a simple way of calculating the measurement of the pallet cover you need. 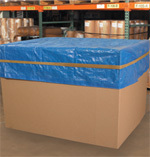 To determine the Width (W) of the cover, add 1"-2" to the width of the pallet. 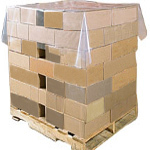 To determine the Depth (D) of the cover, add 1"-2" to the depth of the pallet. 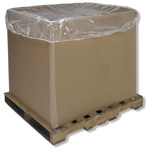 Example: If the pallet size is 40"(wide) x 36"(deep) x 50"(high), the cover dimensions are as follows: Width (W) is 42" Depth (D) is 38" Length (L) is 68"